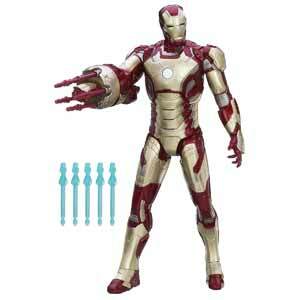 Hasbro celebrates the world of Iron Man with a new toy line featuring the iconic Super Hero. The new Sonic Blasting Action Figure is a giant 16" action figure that is articulated at the shoulders and hips. 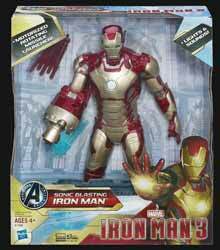 Designed to stand, and fire missiles, this is a very stable figure that also includes speech and sound effects when you press Iron Man's chest mounted light - his eyes light up blue too. Load up his missile launcher with five missiles, push the button on his back and he utters a phrase and fires one or more missile automatically. The figure requites 3 x AA batteries and comes with 10 missiles. This is a well constructed figure, which looks great. However, it's probably more of a show piece than a toy you'll want your kids to throw in the toybox.